Deceptively simple in appearance, modern axle shaft technology is actually quite technical and complicated. I certainly do not posess all the answers; niether, on the other hand, does any other single person as far as I can tell. In this part of the BillaVista-60 article I will share with you everything I have learned about alloy axles, shaft technology, and splines. Hopefully this will help to explain and illuminate why I decided to build my axle using Superior Alloy Axle shafts, and allow you to make your own product evaluations and purchasing decisions from an educated, or at least informed, point of view. That said - there are no inarguable absoloute truths in the world of axle shaft technology. Major manufacturers and many talented professional engineers often have serious disagreements on the topic. One of the reasons for this, especially in our case (dealing with 4x4 front axles) is that, as a sport, rockcrawling is still really in it's infancy - meaning there hasn't yet been time for the generations of investment in product R&D that there has in more established motorsports - none of which use front 4x4 axle shafts! Also, as the rockcrawling market is young and growing rapidly, competition is fearce leaving companies and engineers even more tight lipped than their drag racing colleagues. Regarding the first source, consider that the technology involved in front axle shaft design is different than for rear axles; not nearly as much is known or proven in front axle technology as in rear, and those that do know, aren't saying much. Keep in mind that when discussing (or arguing :-) front axle technology, it is not possible to simply refer to what is done with drag racing or other rear axles, as the technology can be quite different - though there are similarities and basic principles we can learn from. Regarding the second source, the OEMs (even if it is only the source from which we extrapolate) are also of limited use to us in navigating the waters of front axle tech because of one simple law, and that law is: "All design is a compromise" This fact, coupled with the requirement for OEM's to generate profit for shareholders as their single goal of overwhelming primacy means they design not the "best" or "strongest' products they can, but thoase that are "adequate for the job, in the shortest time possible, at the cheapest cost" Those are the practical limitations of real-life engineering - they don't have the luxury of designing "ultimate" products. To be sure, they know a great deal about axles, and we can learn from them - but we must temper what we learn with the knowledge that their goals are very different from ours. Which leaves us with the final source - basic engineering principles. Of course, because I am not a professional engineer - I am limited in my ability to apply engineering principles - though I think I can do it well enough to at least be an informed consumer. I will share with you what I know of these principles and how I used them to determine who had the best shafts for the BillaVista-60 - but keep in mind that I am not a pro - just an average Joe. from the industry experts and professional engineers kind enough to share their knowledge at the Pirate44x.com Forum. After all that, the only thing I know for sure is that I don't know everything - not by a long, shot. But I have learned quite a lot, certainly enough to be a well informed consumer. In my front axle I want the strongest axle shaft available. By strongest I mean able to handle the largest torsional load - which is the technical way of saying I want my axle shafts to be able to handle big tires, reasonable horsepower, and hard use in the rocks - steep climbs, axle bouncing, alternately slipping and grabbing, tires wedges amongst rocks - the works, serious abuse! We will look at all 3 in turn. Steel is an awesome material for load bearing structures, like axle shafts, because it is strong, stiff, and elastic in nature. There are many types of steel with wildly varying mechanical properties, from yield strength to percent elongation. There are numerous ways to heat treat steel to improve its mechanical properties, depending on our intended use. Type of steel / alloy and heat treatment must be carefully matched. Generally, the harder a steel is, the stronger it is but also the less ductile. 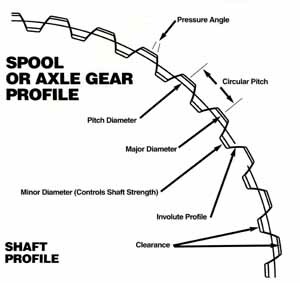 All of these factors are important in the manufacture, or in our case selection, of an axle shaft. Depending on the desired properties of the shaft, different material and methods will be used to make them. - Alloy Steel / through hardened. So what are the different hardening methods? Induction hardening is done by placing the metal part inside or close to an "applicator" coil of one or more turns, through which alternating current is passed. The coil, formed to suit the general class of work to be heated, is usually made of copper tubing through which water is passed to prevent overheating of the coil itself. In most cases, the work piece is held either in a fixed position or is rotated slowly within or close to the applicator coil. Where the length of work is too gret to permit heating in a fixed position, progressive heating may be employed. Thus, a rod or tube of steel (e.g. an axle shaft) may be fed through an applicator coil of one or more turns so that the heating zone travels progressively along the entire length of the work piece. In the case of axle shafts, the shaft is passed through the coil, and the coil has to be of a small enough diameter so that it is close enough to the shaft to do the heating. Unfortunately the small diameter of the coil prevents the passage of the yoke (or flange in a rear axle), which means induction hardened front axle shafts do not have hardened yokes. This is, of course, a MAJOR weak point, as it is very often the thin, soft yokes that are the weakest part of a front shaft and therefore the first part to fail. Induction hardening will be done to a certain hardness level, and do a certain depth from the surface, called the "case depth". Typically induction hardening penetrates to about 0.150-inch and the axle core remains relativley soft. Typically, the shaft surface hardness is a very hard 55-58 Rockwell (almost brittle). There are some benefits to induction hardening, even over through hardening. The exact physical and chemical metalurgy is beyond the scope of this article, but basically the induction hardeneing process leaves the shaft so hard at the surface, thet there is a residual compressive stress at the surface (using our lego-block analogy from Part 1a, imagine the surface lego blocks being pressed down on, making them harder to bend apart). This residual compressive stress actually improves fatigue resistance and prolongs fatige life. Why? Because most fatigue cracks initiate at imperfections at the surface of the shaft (scuffs, knicks, burrs, rust, corrosion, grinding marks, etc) and grow from there. The residual compressive stress makes crack tip advance under cyclic loading more difficult. Note also that other surface treatments help to prevent crack propogation, from finish grinding and polishing to paint or other coating application. Through hardening, though in reality very technical, is much easier to describe. Essentially the entire part is placed in a large (but very special) oven-like machine and then heated up, and held at a certain temperature. The part is then the cooled at very specific and carefully controlled rate. The result is, the entire part is hardened, including the yokes, AND the part is hardened THROUGH it's entire thickness, hence the name - through hardening. Through hardening produces a part with a much more even and uniform crystal lattice structure (grain), and therefore with much improved mechanical properties - notably yield and ultimate strengths. Take for example, 4340 Chrom-moly steel, In its normalized state (having a hardeness of Rockwell C 22) is has an approximate Ultimate Tensile Strength (UTS) of 112, 000 psi. However, through hardened to a hardness of Rockwell C 42 it has a UTS of approxinmatly 181,000 psi! Picture graphically illustrating difference between through hardening and induction hardening. Pic from Strange Engineering ad. Clearly, through hardening an axle shaft makes it vastly stronger and therefore through hardening is a must for any shaft to be considered for the title of "ultimte." Of course, the ideal treatment would be a combination of through hardening and induction hardening, to take advantage of the best of both worlds. There is one manufacturer who does this, and ONLY one in the 4x4 axle shaft aftermarket that does. The answer should come as no surprise - Superior Axle and Gear! Annealed = the softened form, softest condition. Normalized = the normal, plain, neutral form. Normalization "erases" prior heat treatment. Quenched and Tempered = heat treated / hardened. Regardless of the steel's condition we can clarly see that the cr-mo steel has much greater tensile strength. Recall from part 1 this is due to the addition of the alloying elements themselves - the chromium and molybdenum. Therefore, manufacturing axle shafts from an alloy steel, though much more difficult, time consuming, and expensive, gives us the double-advantage of greater strength because of the material itself AND grater strength because of the through hardening possible. So what does all this mean to the shaft? It's NOT what most people think! The little known FACT is, the material and how it is heat treated have NOTHING to do with how much the axle will twist under a given load. How much an axle will twist is determined by the torsional modulus of elasticity of the axle, which as you will recall from part 1 is a constant for all steels. This means that all axles, of the same size and profile (shape), under the same load will twist exactly the same amount. If you were to take identical Spicer OEM (SAE 1055), Moser (1541M), Dutchman (1541H), and Superior (4340) axles and chuck them in a torsional testing machine and apply the same load, you would see them all twist exactly the same amount. The difference is: depending on what steel or alloy they are made from, they will behave differently when that load is released. Recall the stress/strain diagrams and properties from Part 1a - The differnt steels and alloys have differnet mechanical properties and therefore stress/strain curves. the "better" alloy steels will have a much greater 'elastic range" and much greater yield strengths, meaning they will spring back unharmed to original size and shape where the lessers steels may not. Lets' say, for the sake of argument that we we put 120,000 psi load on the axle shaft (say, by wedging a tire and tromping the gas) - Regardless of the axle material they will all twist the same amount, however, the one made from 1030 carbon steel will have had its Ultimate Strength exceeded, and so will break. The one made from 1541 may only have had its yield strength exceeded and so will not rupture but will not return eactly to it's original shape - it will have twisted or taken a permanent set. The alloy axle made from 4340 will have had niether its ultimate strength nor its yield strength exceeded, and so will return to exact original size and shape - in effect shrugging off the load an carrying on unharmed. In short, the "better" axles made from alloy steel and through hardened are "stronger" not becasue they resist twisting more or twist less under load, but because they are made from a material and process that allows them to handle the twisting better, to survive it unscathed. That's what being built for the task is all about, and THAT is what makes the best 4x4 shaft! Note that in the equation, the diameter of th shaft (D) is raised to the power of 4. This shows mathematically why a larger shaft is "stronger" than a smaller one, because it twists less (resists the load better or has a steeper stress/strain curve). Note that this "stronger" - strength of size - is quite different from the "stronger" attributable to material and treatment. Strength of material - Shafts made of better material and process (alloy shafts, through hardened) are stronger because they can take much larger loads before yield and rupture. They "shrug off" applied loads much better. Both play a part in determing how much load a shaft can take, and therefore when it will fail, and therefore how suitable it is for our intended use. However, you begin to see how difficult it is to just label something as "stronger". Ideally, for the shaft to be ultimate we want it to be as large as possible, constructed of as a high a grade of alloy steel as possible, through hardened, and if possible, induction hardened for fatigue life as well. Mark Williams chromium-molybdenum-nickel alloy Through hardened (austempered) Rear axles only. Through hardened RC 46-48 Not as good as 4340 but much cheaper, very tough, don't like bending. Rear axles only. Strange 1541M Induction Hardened RC 58-62 Rear axles only. Summers Brothers alloy steel through hardened Rear axles only. We already know why the profile, or shape of the axle shaft is so important to its strength - we just may not know that we know! When we combine what we already know with the concept of "stress concentration" and the first law of thermodynamics, we will truly understand the importance of axle shaft profile. The first law of thermodynamics. Trust me - it's important. When we apply a force or load to a part we apply stress (stress is merely the force divided by the cross sectional area). We can imagine the overall stress we put on a part to be made up of innumerable seperate forces which in turn we can visualize as being tiny threads or straight lines running through the part. For example, if we take a solid, constant diameter steel shaft and pull on opposite ends (place it in tension) the stress in the shaft can be pictured as countless tiny lines of stress running the length of the shaft from one end to the other. These lines are formally known as "stress trajectories"
You see, the thing about stress bunching up, is that it is now concentrated - and that can and will cause failures. For example, imagine our plain steel shaft has a cross sectional area of 1 square inch. Suppose we placed a tensile force of 100 pounds on it. The uniform stress in the shaft would be 100 psi, with all the stress trajectories happily running along the length of the bar. Now suppose we cut a notch in the shaft, or reduced its diameter - suddenly some of the stress trajectories would have to bunch up to get around the interruption, causing a stress concentration. Mathematicaly we have suddenly reduced the cross sectional area in that spot to < 1 sq. in. so that the 100 lb force is divided by <1 sq. in. so that the stress, in pounds PER square inch, goes up. The severity of the stress concentration depends on how suddenly the area changes, and any change in shape or area that causes the stress trajectories to focus into a smaller area,(to bunch up), will produce a stress concentration - holes, notches, grooves, cracks, radius changes, are all guilty. These areas of stress concentration are known as "stress raisers". In our example, let's assume the ultimate tensile strength of the shaft was 150 psi. When we pull on the unmolested shaft with a force of 100 psi, the shaft is fine - it carries the load without problem. However, once we add a stress raiser, we can easily cause the stress to concentrate in that area to a level above the UTS of 150psi, causing the shaft to rupture at that point EVEN THOUGH WE ARE ONLY PULLING ON IT WITHH 100 PSI, LESS THAN THE UTS!! Picture from "Engineer to Win"
Of course, not all stress raisers can be eliminated - we have to drill holes in things, things have to have corners and shape changes, and in the case of front axle shafts there need to be shaft diameter changes (section changes). The key is, to make changes in shape as gentle and smooth as possible. Any time there is a section change, no matter how small, there must be a fillet radius - and the radius must blend smoothly into both adjacent surfaces. There can be no exceptions if we expect the part to live. Picture illustrating the concept of a fillet radius. Part on the right has it. The fillet radius is labelled "r" in the shaft diagram. 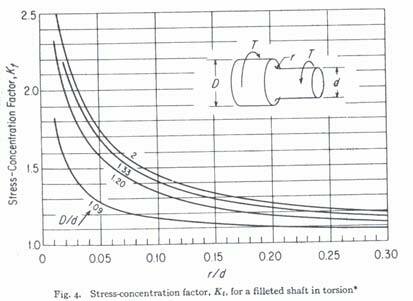 Note that as the radius of the fillet (r) gets larger r/d (horizontal axis) gets larger, and the stress concentration goes down. This effect is magnified the larger the section change. In other words the bigger the difference between the small part and the large part of the shaft, the more critical the fillet radius. What do we mean by a shafts profile? As illustrated by the following 3 pics, when we speak of a shafts profile, we mean the various diameters along its length, (its section changes) from the splined end to the yoke. Spicer (top) and Superior Alloy D60 short side inner shafts. 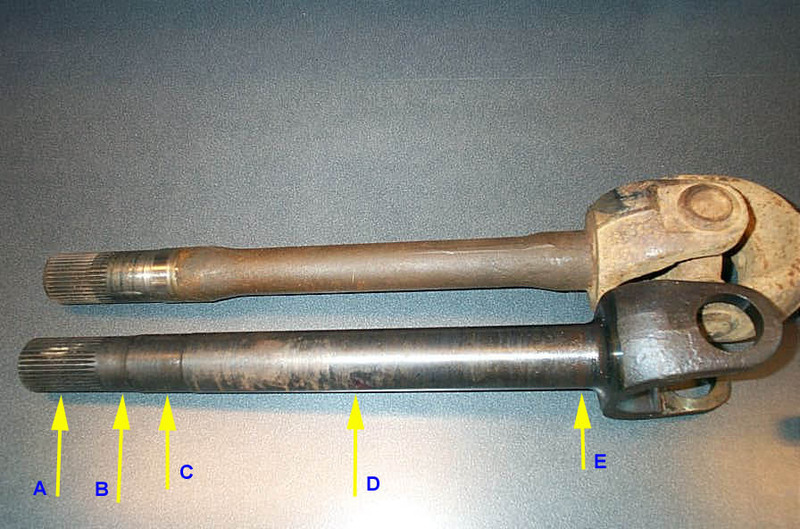 Spicer (top) and Superior alloy D60 stub shafts. 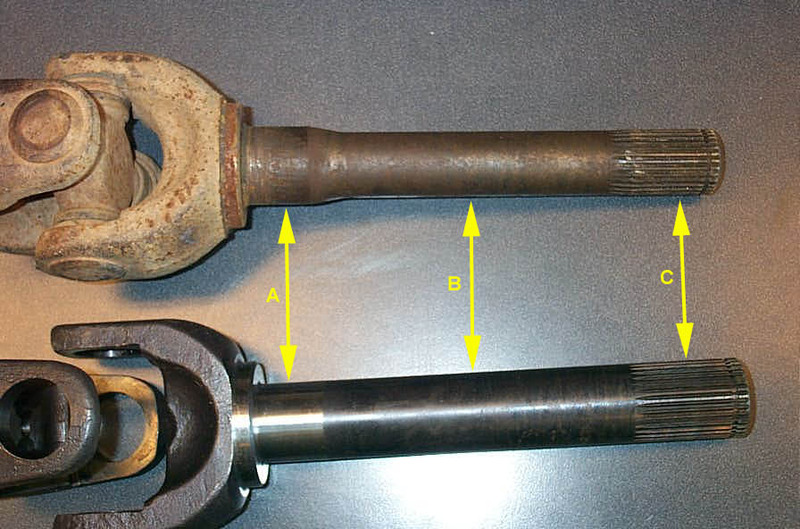 Axle shafts, by necessary design, will have section changes - resulting in stress concentrations. Shaft diameter has huge effect on torsional deflection of the shaft (How much a solid steel shaft will twist under load is dependant on the diameter of th shaft raised to the power of 4. What does all this have to do with the "ultimate" shaft? Every splined axle shaft has at least one huge stress raiser by virtue of it's design. The point at which the splines end is natural stress raiser. Why should this be so? Imagine a wheel wedged between 2 rocks, but the throttle pressed and torque applied to the axle shaft. The splined portion of the shaft, engaged in the carrier, is, in a manner, held fast. Because the wheel is held steady, the shaft will immediately twist. Because the force is input via the carrier, we can instinctively imagine how the stress would concentrate where the splines end. The concept would be similar to the following example: chuck a thin stick of wood vertically in your vice, sticking up a couple of feet. Apply a force to the top of it by pushing, and you already know where it will snap - right where the jaws of the vice clamp it. Same deal with the splines. Now, admittedly the torsional stress an axle shaft experiences is significantly more complicated (being a combination of tension, compression, and shear) than the simple tension or shear stress examples we have been using to illustrate concepts - however, we can still use these simple models to understand the concepts. Here's what Carroll Smith has to say, in his usually extremely blunt fashion, about splined shafts profile, particularly in the area of the end of the splines. Splines MUST be placed on a diameter that is greater then the operating diameter of the part, or they must be eliminated from the design. Spline roots must never be allowed to blend into the operating diameter. So, in order to deal with the spline stres raiser, the textbook way to build an axle shaft is to make the operating diameter of the shaft smaller than the diameter of the splines. This not only serves to reduce the stress raiser at the root of the splines, but, if we re-examine the equation for torsional deflection, we can easily see how this reduced diameter also allows the axle shaft to twist more. Recalling how energy is converted, this twisting allows the shaft to convert the energy (mainly into heat through internal friction) as opposed to just transferring it where it would break u-joints, ring and pinions, driveshafts, transmission outputs, etc. As we dicussed under material - the key is then to build the shaft from a high enough quality material to be able to handle this twisting comfortably withing the elastic range. This "reduction of shaft diameter after the splines" is often commonly referred to (and often with a negative connotation) as "neckdown". This proper neckdown IS NOT to be confused with what the OEM's do (e.g. notorious D44 front axle neckdown). That OEM Spicer neckdown is done either as a manufacturing convenience (to facilitate quick, easy splining) or to introduce an intentional design weak point (so that if the ring and pinion fails/siezes in 4wd the shaft breaks and the wheels remain free and steerable as opposed to the front wheels locking up) - depending on who you ask. Note that there is a discrepancy between this neckdown rule, and making the diameter of the shaft as large as possible for maximum strength. Like all design - there is a trade off and a compromise must be reached. With this in mind, consider that when building a stock-replacement axle to fit into existing carriers, the manufacturer is limited to an existing, exact spline size - thay can't make it larger or smaller - the splines have to fit the carrier. So, in order to obey the neckdown rule, they would have to make the shaft, in the case of a D60, smaller than 1.50". This may well cross the line of diminishing return. 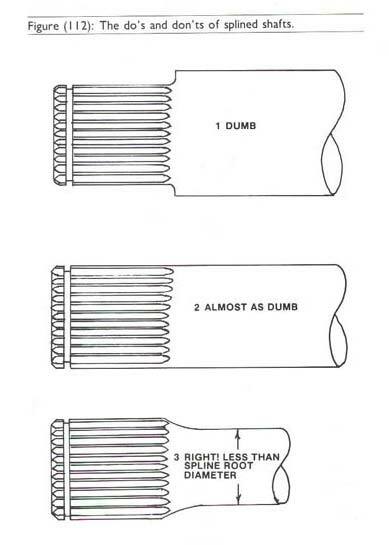 In other words, when the final engineering alanlysis is done, it may turn out that keeping the shaft operating diameter at 1.50" actually imparts greater overall load carrying capacity/strength to the shaft than would obeying the neckdown rule. Add in the strength of the materials, as well as the cost/complexity factor of manufacturing an axle with a neckdown and we begin to get a clearer picture. There are, in fact, no aftermarket companies that I'm aware of making replacement shafts for Dana axles with this particular profile feature, the proper neckdown - not even Superior. I asked aorund amongst all my contacts and tried to find out why - nobody's talking. I suspect that the added complexity and expense of this design, especially when balanced aginst the wide design margin afforded by the high quality materials (heat treated 4340) in use amongst the top companies, and the trad-off in strength vs shaft diameter, when coupled with an analysis of the shafts required duties (in a rock-crawler, as opposed to darg car etc.) that the decision is that it's just not worth it. I do know, however, that certain axles built by Sandy Cone and other suppliers to the big $$ trophy trucks have the textbook neckdown profile - it's just not common on front D60 4x4 shafts. The concept of equal torque. There is one more important aspect of axle shaft profile we should examine before moving on, and that is the concept of equal torque. Imagine climbing a steep, rocky climb. You need to get your foot into it, and as result you're hopping and skidding all over the place with the weight bouncing around and the tires alternatly spinning and then suddenly grabbing traction. This is a nightmare for axle shaft survival - but a scenario we commonly encounter and expect our parts to survive! In this scenario, or any other high-load situation, the axle as an assembly has the greatest chance of survival if both shafts survive. For both shafts to survive - the best scenario is for them to share the abuse / stress; to participate equally in sharing the load. In my front axle in any given "all wheels driving" sitaution, for each shaft G and T are equal, or about equal, and l is quite different: meaning that if D is constant between the 2 shafts, the longer shaft will twist more than the short. This will normally allow the energy to be dissapated better in the longer, greater twisting shaft than in the short shaft - this explains why quite often we see more broken short side axles than long. The converse is also possible, depending on the nature of the loading on the axle (magnitude, axle material, etc), the long side axle may fail prematurly because it twists so much more than the short side. Either way this explains why some rigs perpetually break one side or the other. Regardless, the optimum situation is to have both shafts share the load and twist equally - therby creating the most reliable and predictable assmbly. This concept is the concept of equal torque. On last look at the equation, and we see that for either shaft of any given axle we can't change l or G, and we have no real way to predict or control T (except let up on the loud pedal - and what fun is that?) so the only way to achieve equal torque loading of the shafts is to alter D between the shafts. Note that D is raised to the fourth power so that small changes in shaft diameter have relatively large effects on how much the shaft will twist. A well made axle shaft will take this into account. Again, it will come as no surprise that Superior do, in a process they call their "exclusive (patent pending) Torque Equalizing Diameter Profile"
OK, so if we understand material, heat treatment, neckdown, operating diameter, and torque equalization, it's time to consider the last factor in shaft design - splines. The actual splined section of an axle shaft has a dramatic effect on the overall strength of an axle shaft; from their size, shape and angle to how they were made and how well they fit in the carrier. A splined shaft has a minor and major diamter and is further classified by the shape of the splines, the pressure angle, the number of teeth, and the diametrical pitch. As illustrated in the diagram above, the major diameter is the diameter of the splined section of the shaft measured at the outside or tips of the teeth of the splines. The diameter of the shaft at the bottom of the grooves between the teeth is the minor diameter of the splines. Square cut splines are quite old-fashioned and are rarely used anymore. However, I mention them because some aftermarket axle shaft shorten-and-respline outfits cut splines using equipment that is not able to reproduce the correct involute spline profile. This is a disaster because, even if you can get the square cut splined shaft to engage with the involute spline carrier, the contact points will be focused on a very concentrated area, causing enormous stress concentrations - and we know all about avoiding them, don't we!. The only way to produce the correct involute spline is to roll, hobb, or cut them using a single point cutting process with a correctly shaped cutter. Axles that have been made or resplined using a flycutting procedure will NOT have proper involute splines. 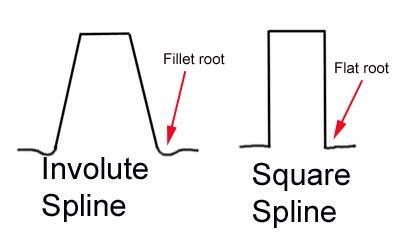 In addition to the shape of the tooth splines also have a fillet root or flat root. The root of the spline is the area where the tooth originates from the shaft. as you can imagine, the root would be an enormous concentration of shearing stress. 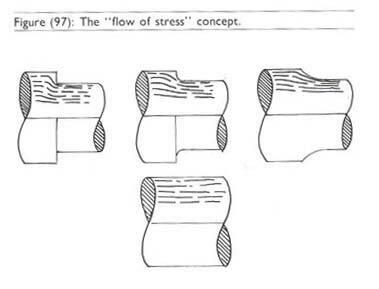 Recall from our discussion on the flow of stress that a fillet radius will help relieve this concentration of stress, which must be balanced against the slightly smaller minor diameter . tions, flat roots let you have a larger minor diameter for greater torque capacity. Most of our axles are fillet root. Not all involute splines are the same shape - there are variation in exact "tooth shape" possibe. These differences in tooth shape are known as the pressure angle of the spline. The pressure angle is the basic included angle of the spline tooth (see diagram above). Common axle spline pressure angles are 30* (60* included angle) and 45* (90* included angle). 45* pressure angle splines offer a slight strength advantage because for a given major diameter spline the teeth of a 45* spline are shorter-allowing for a larger minor diameter size. Dana and some GM axles are 30 deg. , Ford, Toyota, some GM, and most racing axles are 45 deg. Some rockwell and older axles are 37.5 deg pressure angle. The most importnat thing is to ensure you MATCH the pressure angle of the shaft with the pressure angle of the carrier being used. It is no good at all to try and cram a 45* pressure angle aftermarket axle shaft into an OEM 30* pressure angle carrier - like forcing a square cut spline in an involute carrier, the stress would be focused on far too small an area creating uneven pressure points and unnaceptable stress raisers begging for failure. Diametrical pitch of splined shaft is a specification that relates the number of splines to the size of the shaft. This spec is what allows us to refer to an axle as just "35 spline" and be able to compare it to a "30 spline" axle without having to also list the minor and major diameters of the shafts. For example, almost anyone would instinctively tell you that a 35 spline shaft was stronger than a 30 spline shaft. But what if the 35 spline shaft had a minor diameter of 1 inch and the 30 spline shaft had a minor diameter of 2 inches? I can tell you without doing the engineering math that the 30 spline 2' shaft would be stronger. To avoid this confusion, and indeed to insure that the number of splines and the size of the shaft are standardized so that the teeth are evenly spaced and parts can be made to fit together, we have the concept of diametrical pitch. We are familiar with the fact that there are a limited, set number of standard threads-per-inch available that match certain bolt sizes (e.g. a 3/8" bolt has either 16 (coarse) or 24 (fine) threads per inch) so that we may have a reasonable chance of finding nuts and bolts that fit together - can you imagine if the number of different threads per inch for any size bolt were unlmited?!! In the same way, splined shafts must have a limited number of possible diameter and # of teeth combinations. Instead of threads-per-inch, diametrical pitch is used. The pitch diameter of a splined shaft is is the mid-point between the major and minor diameters. The diametrical pitch is the number of teeth per inch of pitch diameter, similar to the number of threads per inch specified for bolt threads. Because the splines are all the same size and shape, the distance between the centerline of adjacent splines (the circular pitch) remains constant. Therefore as the pitch diameter of the shaft increases, more teeth can "fit around" the pitch diameter, and therefore the larger the shaft diameter the larger the number of splines for any given diametrical pitch. An actual diametrical pitch specification will be a number specifying the number of teeth per inch of pitch diameter. Industry standards state that most modern automotive axle shafts (All of the 28, 30, 31, 35, 40 spline axles that interest us) are 24-pitch. Therefore, if the shaft had a 1-inch circular pitch diameter it would have exactly 24 splines (or teeth). Using this standard diametrical pitch of 24-pitch a 35-spline axle has a major diameter of 1,500 inches; a 40-spline 1.708 inches. Note that if you know the diametrical pitch of a splined shaft you can calculate its major diameter. This may be counter-intuitive, as it may seem as if one would decide to use a 1.5" diameter shaft, and then decide to cut splines into and settle on 35 splines. This is not how it actually works, In reality, the pitch controls the major diameter, as the following equation demonstrates. Using the eqation you can calculate the number of splines on any size shaft or conversely the size of any shaft given the pitch and number of splines. Q: What is the major diameter of a 35 spline shaft? A: N=35, assume P=24, Do=(N+1)/p = (35+1)/24 = 36/34 = 1.50"
Yipeeee! Fun with math again! Q: - What is the major diameter of a 30 spline Dana axle? We have come to the final factor to consider in axle spline technology and indeed in the whole process of deciding which axle shaft is the best - and that is the topic of how the splines are formed in the shaft. 1. Rolling the spline: This is a cold-working process. It is done by a huge and powerful hydraulic powered machine that presses the splines into the shaft with anything from 2,500 psi - 7,000 psi, depending on the shaft. Recall from part 1 of the article that this cold-working process produces a refined and more consistant grain structure, resulting in a stronger part. The rolling machine has 2 plates that are extremely hard dies with the appropriate spline shape to them. The axle is rolled between these plates, one top and one bottom, and the splines are thus cold formed into the shaft. This is the very best way possible to form a spline as it is a cold working process, it removes no material from the shaft, and finally because it is done prior to the axle shaft being heat treated (hardened). 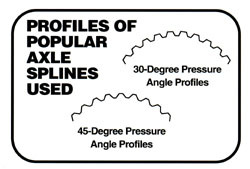 Compared to a spline cut after hardening, a properly rolled spline will be up to 30 or 35% stronger. There are VERY few companies capable of rolling splines. The only two I know of are Dana/Spicer and Superior Axle and Gear. The drawback (for a manufacturer) to rolling splines is that not only is the equipment very expensive, but it is also time-consuming to set up, so that it is only feasable to roll splines in axles in large batches. This explains why so few aftermarket axles have rolled splines, and why virtually no custom shafts will have rolled splines. You can see a short video clip of an axle spline being rolled at Superior Axle and Gear HERE. 2. 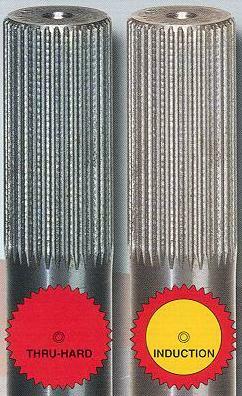 Hobbing: Hobbing splines is the second-best way to from a splined shaft. Many very specialized, highly custom race and drag axles have their splines hobbed. The spline hobber is a machine that cuts all the splines at the same time. 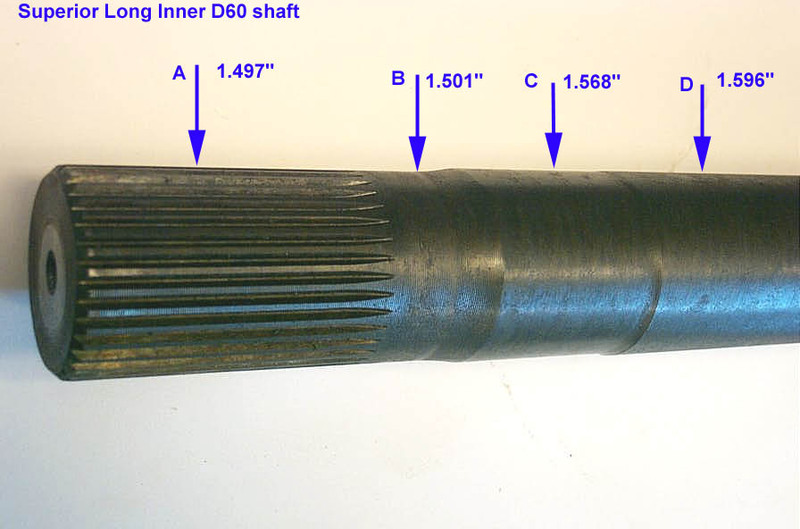 Hobbing produces a true involute spline shape, and if done before the shaft is hardened, some would argue there is very little strength difference between hobbed and rolled splines. Practicaly speaking this is probably quite true, but rolling is still the very best method. 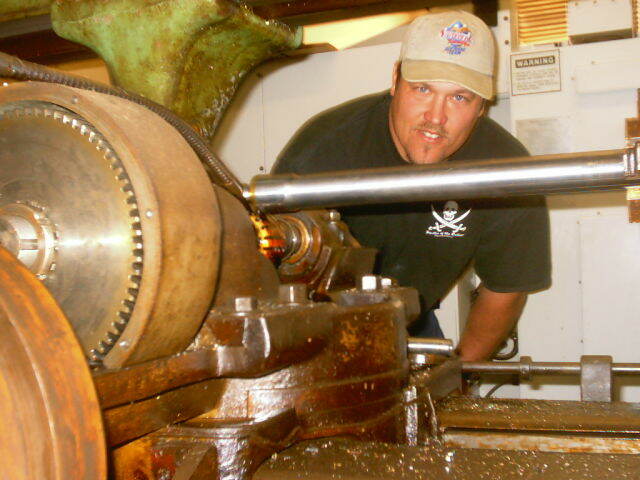 Here is a picture of Pirate4x4.com webmaster Lance Clifford himself watching an axle get splines hobbed at Legendary off-road race axle builder Sandy Cone's shop. Pic courtesy of Camo. Look carefully and notice the "proper" neckdown profile!! You can tell a rolled spline from a hobbed or cut spline quite easily by looking at how the root of the splines terminates. In this pic of D60 inner shafts, the top shaft is a pre-production Superior D60 shaft with hobbed splines, the lower is a Spicer inner shaft with rolled splines. Note the very square ends of the splines in the shaft with rolled splines, compared to the pointy ends of the hobbed splines. In this pic the top shaft is a Spicer stcok D60 stub shaft with rolled splines, the lower is a Superior D60 shaft with hobbed splines. Again, note the different appearance. b) done in such a manner as to produce the proper involute shape, pressure angle, and preferably fillet root. Single point cutting on a mill can produce an involute profile if the cutting tool is shaped correctly. 4. Spline grinding: splines are ground into the shaft with a diamond or carbide tip grinding wheel. this is another process where splines are formed one at a time. I know very little else about this method and I don;t know if or who any 4x4 axle shaft manufacturers use spline grinding. Summary. Rolled splines are best but rare, hobbed splines (done before hardeing) are almost as good, and cut splines have a number of issues and don't really qualify an axle shaft for "ultimate" status. The polar moment of inertia , J, of a cross-section with respect to a polar axis, that is, an axis at right angles to the plane of the cross-section, is defined as the moment of inertia of the cross-section with respect to the point of intersection of the axis and the plane. The polar moment of inertia may be found by taking the sum of the moments of inertia about two perpendicular axes lying in the plane of the cross-section and passing through this point. Thus, for example, the polar moment of inertia of a circular or a square area with respect to a polar axis through the center of gravity is equal to two times the moment of inertia with respect to an axis lying in the plane of the cross-section and passing through the center of gravity. The polar moment of inertia with respect to a polar axis through the cnter of gravity is required for problems involving the torsional strength of shafts since this axis is usually the axis about which twisting of the shaft takes place. The polar section modulus (also called section modulus of torsion), Zp, for circular sections may be found by dividing the polar moment of inertia, J, by the distance, c, from the center of gravity to the most remote fiber. This method may be used to find the approximate value of the polar section modulus of sections that are nearly round. The polar section modulus multiplied by the allowable torsional shearing stress gives the allowable twisting moment to which a shaft may be subjected. In the meantime feel free to check out some of my research on axle failures at the following thread onm the PBB. Axle failures. Hopefully this brief look at the tech behind axle shafts has been informative and has shown that there's a lot more to the topic than might forst appear. It should also greatly assist in discussions or debates about who or what is best . I certainly hope that it illustrates that in choosing shafts for the BV-60 I didn't just pull any manufacturer out of my hat. Proper Neckdown Not present on the Superior shafts - I guess nobody's perfect! Torque Equalization Superior design this in with what they call "Torque Equalizing Diameter Profile"
Rolled or Hobbed involute splines Superior alloy D60 inner shafts have hobbed splines and outer (stub) shafts have rolled splines.